For more than a century, DETEX has earned the trust of millions of property owners to secure and protect their people and property. Attack resistant design for maximum holding force. Proven durability and reliability at a reasonable price. Straightforward operation that everyone understands. Time tested construction resists attack from the inside. Reduces employee and customer theft. Photo-Luminescent sign for added visibility in low light conditions. Deadbolt lock throw is 1" with just over 3/4" engagement with the frame. Device has a 100 dB alarm which is powered by a 9-Volt Battery (Included). Locking and Unlocking (Dead Bolt) always arms and disarms the alarm. 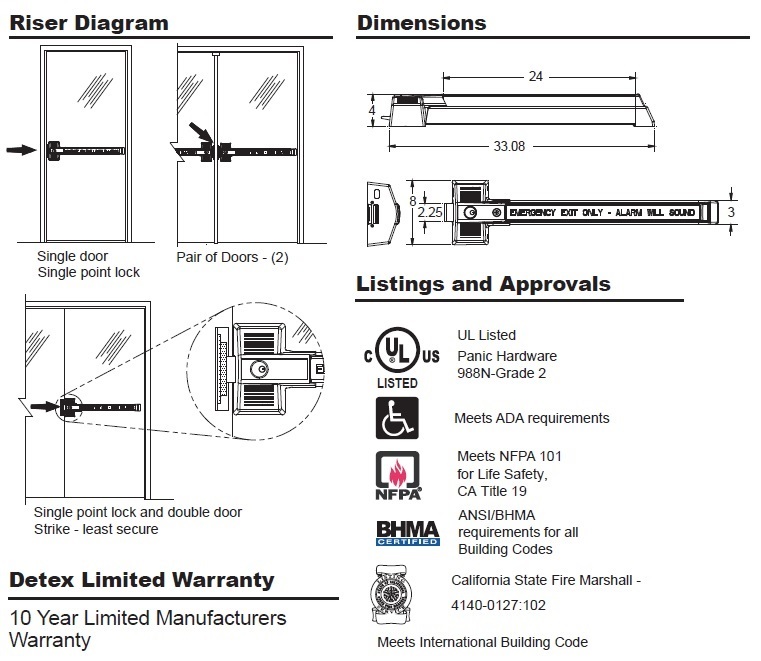 Low profile meets IBC requirement allowing for 4" maximum protection off face of door. Resetting the alarm can only be done with the control key.